This is my cat Nigel Bunster. 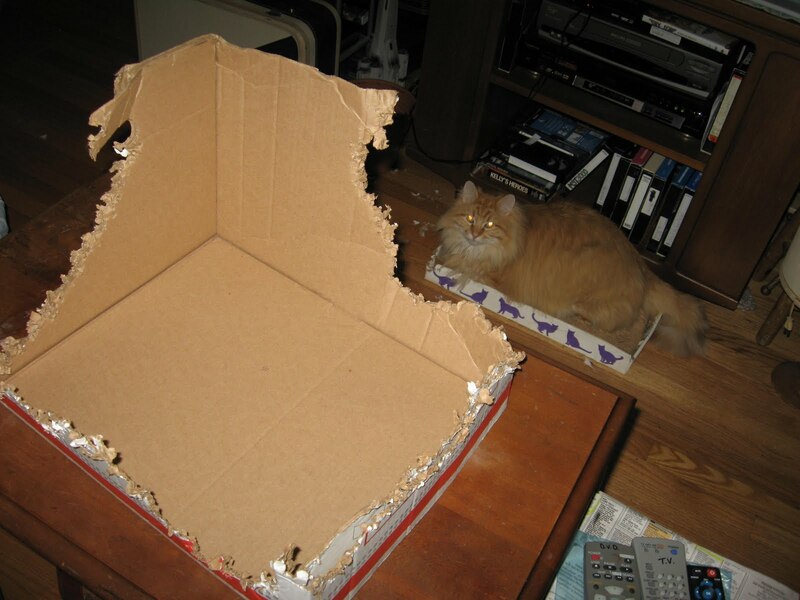 He has a paper fixation. When he's upset or bored, he will shred paper and boxes. He has literally eaten my homework if I am silly enough to leave it out. 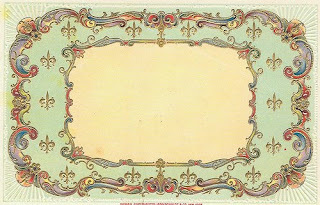 Here is a sample of his handiwork. He's very thorough, don't you think? The funny thing is, he's missing most of his teeth, yet he still manages a masterpiece like this. Congrats Miss Cherry. I sent you an email and you have 48 hours to reply. If you don't get the email for some reason, contact me! Thanks to everyone else. I will be having another awesome giveaway soon, so keep your eyes peeled. Ends April 6th, so hurry on over and enter. I know I did! Talking about giveaways, keep your eyes peeled for the winner of my birthday giveaway later today! 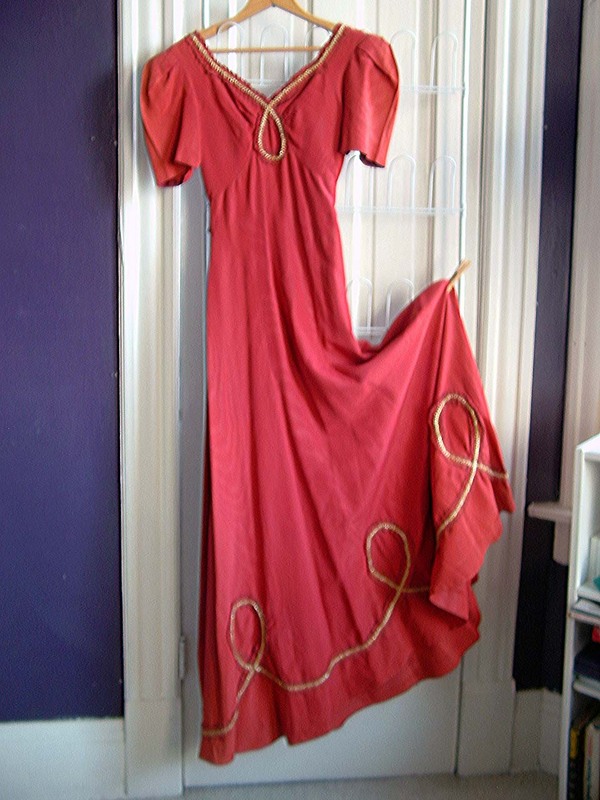 Beautiful moire taffeta bias-cut evening gown from the 30s. Side closure with hooks and eyes. Ruched trim details the sweetheart neckline and around the hem. 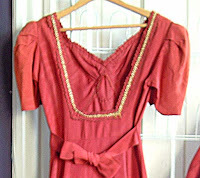 Metallic trim has been added to the dress, which is not original, but is easily removed if desired. The back is low and square (see picture). 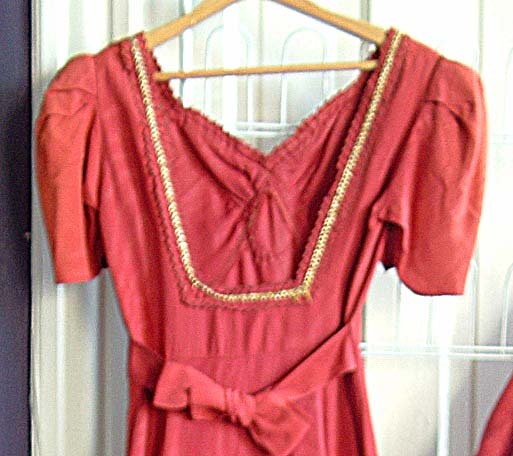 The dress is in excellent condition and I have not been able to find any issues with it. View the detail for a better view of the color, which is a darker salmon. Cute as a button and ready for some spring cooking, this apron is in great shape and ready to go! Hand embroidered. Handmade apron is in good shape (a few stray threads) with a full skirt and yellow ric rac trim. Original Tart Deco creation with rust-colored mum nestled in the middle of a vibrant 6" yellow flower. Securely attached to a single salon clip and ready to paired with a fun Hawaiian dress. So, that's group #5. You have until March 31st midnight, central time, to contact me to claim any of these goodies. First come, first serve and you may claim as many as you'd like (I will combine shipping for multiple items). Just remember that you have to pay within 3 days of your reserve listing or you lose the blog price, as per my posted instructions. I always assumed that if something was on the internet I could just bookmark the page and read it whenever I wanted. Now I know that is not true. Websites become defunct or migrate, or just plain disappear for whatever reason. 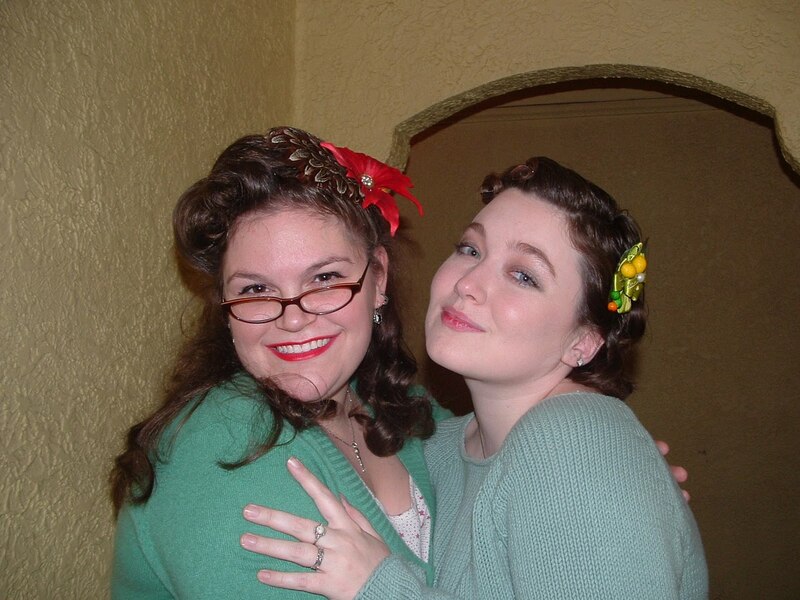 Enter the Wayback Machine to save the day. An offshoot of the Internet Archive project, the Wayback Machine strives to archive the whole internet, starting from 1996 to a few months ago (it takes a couple months to archive the content). You can enter a url and the Wayback Machine will show you any archives it has of the page, including prior versions of the site. Libraries exist to preserve society's cultural artifacts and to provide access to them. If libraries are to continue to foster education and scholarship in this era of digital technology, it's essential for them to extend those functions into the digital world. The Internet Archive is working to prevent the Internet - a new medium with major historical significance - and other "born-digital" materials from disappearing into the past. Collaborating with institutions including the Library of Congress and the Smithsonian, we are working to preserve a record for generations to come. Open and free access to literature and other writings has long been considered essential to education and to the maintenance of an open society. Public and philanthropic enterprises have supported it through the ages. Now the Internet Archive includes texts, audio, moving images, and software as well as archived web pages in our collections, and is working to provide specialized services relating to training, education, or adaptive reading or information access needs of blind or other persons with disabilities. I get a ton of 1920s/flapper music for research for my vocal group Bootless Betties on this site. It also has amazing videos chock full of vintage goodness from many eras. Make sure to leave yourself a few hours to peruse this awesome website. Also, silently thank librarians for making this happen, because they are the gatekeepers of information and fight every day to keep knowledge available to all of us! 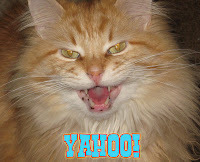 Okay, I may be getting addicted to blog swaps. 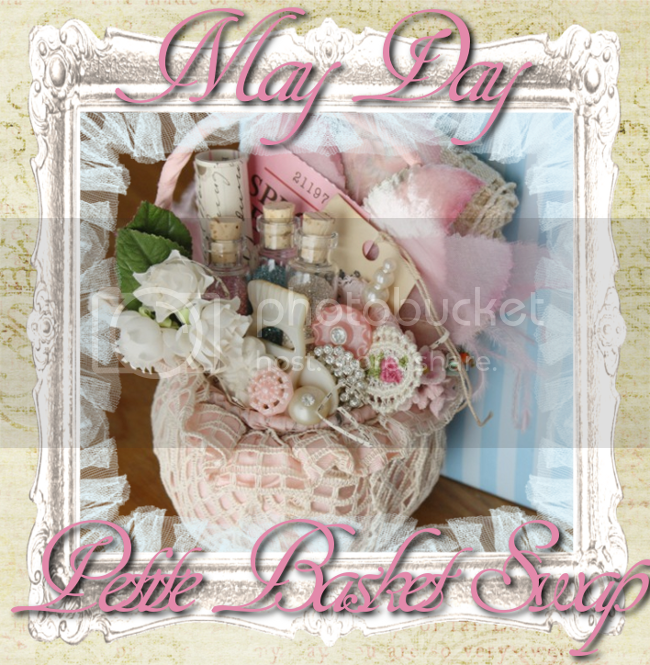 I am in 2 basket swaps right now and I had SO much fun putting together the baskets! Here are some sneak peeks of what I put together. Click on the pics for larger images. 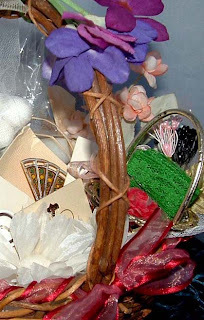 Talking about giving and receiving- don't forget my birthday giveaway for a custom hair piece. Ends Tuesday night, so don't wait too long! 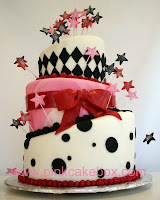 Saturday is my 39th birthday and I want to celebrate it with my awesome blog friends! I may not have mentioned this before, but I LOVE making custom hair pieces for people. It's always a creative challenge to take someone's ideas and make them live through craft. I put a lot of love into each of my creations anyway, but there's always something extra in a custom piece because I have a person in mind when I make it. I also find it very relaxing to have a purpose when creating. Leave a comment telling me what your dream hair accessory would look like- colors, trim, bling, movie you saw it in, anything that helps us to visualize it. Be as vivid as you can because if I like your description I will give you an extra entry! You MUST leave an email that I can contact you at if it is not publicly available through your profile. The giveaway ends Tuesday, March 30th at midnight, central time. The giveaway is open to U.S. readers. International readers can enter if they are willing to pay for shipping. p.s. I originally had the giveaway posted in the blog specials #4 post, but it was too confusing, so I've reposted here with extra time to enter. Here is set number four of items at a special blog price to my readers. These blog prices are 40-60% less than what they will be listed as on etsy later. Remember the rules I posted earlier, you have 3 days from posting to contact me to reserve the items at the blog price. After that they get added to my etsy shop at a higher, permanent price. As always, click on the pictures for a larger, more detailed view. Great shape. Double layer at the neckline makes this slip a great choice to wear under sheer sweaters or jackets. Excellent condition. The high-waist compliments the mid-calf length. 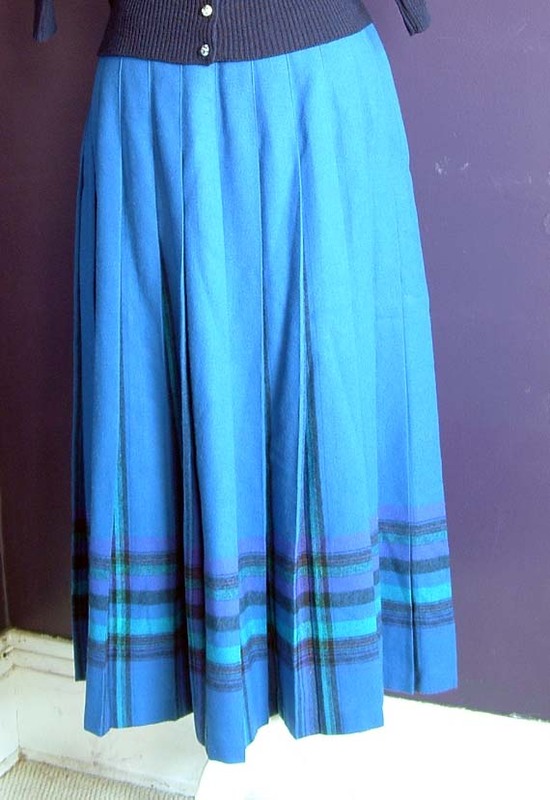 Plaid near hem and inside of pleats. Plastic side zipper, works great. No pulls, but there is a small hole on the waistband that could easily be sewn closed. 6" pink flower with peacock feathers and wisps. Get someone's attention at Viva Las Vegas with this one for sure! The #4 blog specials both end Sunday, March 28th at midnight, central time. For blog specials, contact me to claim any. First come, first serve and you may claim as many as you'd like (I will combine shipping for multiple items). Just remember that you have to pay within 3 days of your reserve listing or you lose the blog price, as per my posted instructions. Labels: Blog Spotlight, Giveaways, Tart Deco, What's on Sale? Blog specials are back! Here is the third set of items at a special blog price to my readers. The items I chose to list this time are specially picked for their high glamour- just in time for Viva Las Vegas! These blog prices are 40-60% less than what they will be listed as on etsy later. Remember the rules I posted earlier, you have 3 days from posting to contact me to reserve the items at the blog price. After that they get added to my etsy shop at a higher, permanent price. As always, click on the pictures for a larger, more detailed view. 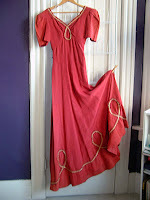 I purchased this vintage housecoat for my wedding for $100 and didn't lose enough weight to wear it (*sigh*). The embroidery at the shoulders is metallic thread with black velvet trim. There is black velvet piping at the top of the mandarin-style neck, bottom of sleeves and on the petal pockets. The housecoat ties in front, but the tie is threaded through two slits at the waist so it is inside the coat at the back. It is in excellent condition, save for a bit of the velvet rubbed off the edge of one button and a few quilting threads that came loose. Adorable vintage knit sweater labeled "Koldin 100% Zephyr Wool." Trimmed with white metal cabs and blue embroidery down the front and on the peter pan collar. The sweater is in very good condition, no major pulls and all the original buttons. The glass buttons had a pearl finish that has rubbed off over the years, so they are essentially clear now. These shoes are in incredibly good condition! The original inserts are still intact and say "Troylings styled by Steven Troy." The bottoms and heel caps are scuffed, but still in great shape and leather is supple Its hard to believe these shoes are over 50 years old. 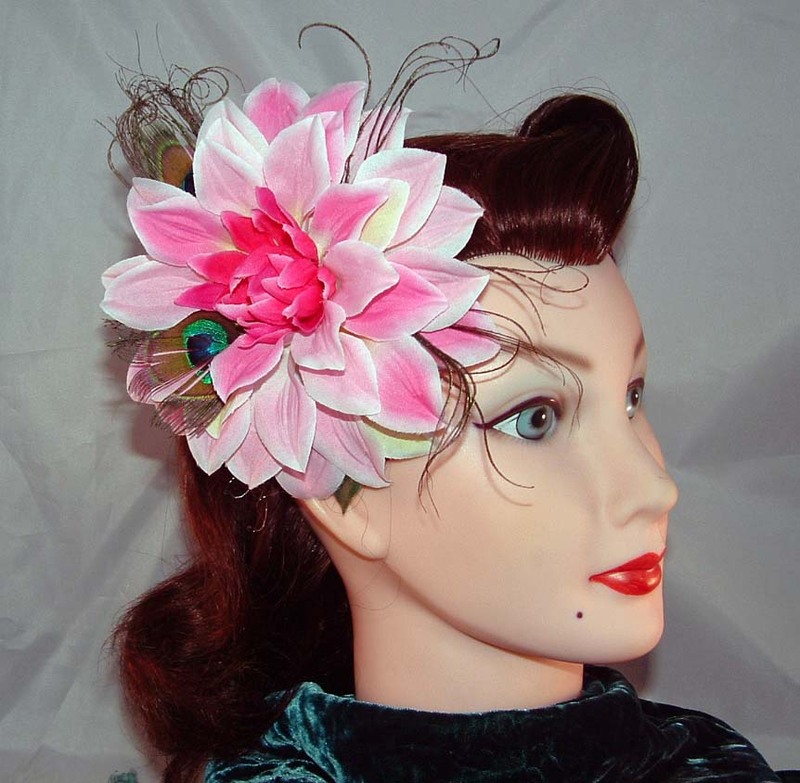 Tart Deco original hair flower made with vintage daisies and leaves and attached to a large salon clip. The piece is made to curve around the ear and is slightly bendable to customize. So, that's group #3. You have until March 25th midnight, central time, to contact me to claim any of these goodies. First come, first serve and you may claim as many as you'd like (I will combine shipping for multiple items). Just remember that you have to pay within 3 days of your reserve listing or you lose the blog price, as per my posted instructions. It's getting warm and I can't wait to start wearing my cotton dresses again. 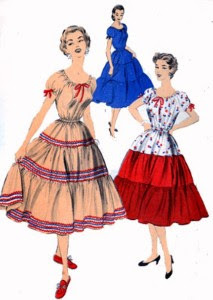 One of my favorite 40-50s looks is the patio or squaw dress with espadrilles. 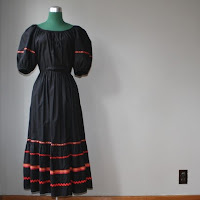 Want to see a nifty vintage video about this popular "western wear?" Click on the image below to go to the video on the internet archive website. I was surprised not to find any cute ankle wrap espadrille wedges on etsy, but I did find a shop on ebay called zapatopiashoes that has various strapped styles, like the ones on the right, that would look adorable with any of these dresses. Payless also has some cute wedges right now too. 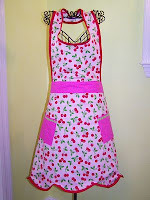 Grosgrain blog is sponsoring a Flirty Aprons giveaway. I LOVE these aprons and you should too. Make sure and pop over to enter! Enter at The Apron Goddesses blog to win your choice of apron from Retro Revival. I especially like how they recycle old linens for some of their adorable aprons. Yeah vintage! 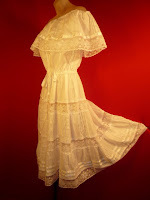 Check out these fun wedding dresses from Dolly Couture! These dresses are in the $400-600 range which, for those of you who have researched brand new wedding dresses know, is pretty affordable. Saw these mentioned on Pink Cupcake Vintage- there are SO many uses for these adorable vintage labels, from the worldlabel.com blog. The best part is that they have been modified for you to be able to add your own text easily, either as one whole sheet with the same text or each label with its own text. Sounds like a super easy DIY wedding item for sure! I'm actually thinking about printing them out without text and using them for handwritten Thank You notes when someone buys something from my shop. Really, the possibilities are endless... any other suggestions? BTW, I apologize for not posting new Blog Special items this week. My comps for library school (25 pages in 2 weeks) is more intense than I originally hoped. Once they are done on March 8th, I will be back on track and will post specials that will certainly make up for it- promise!